Phew! Where does the time go! 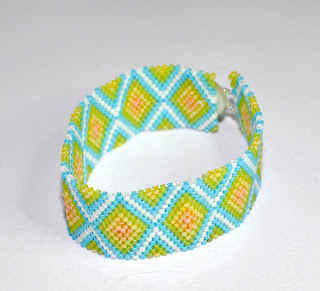 Some really cool beaded bracelets, too! 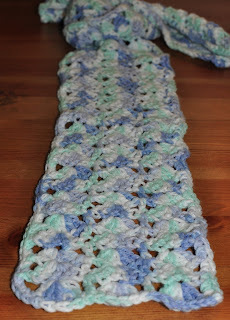 Visit our Etsy shop for these and more to come soon! 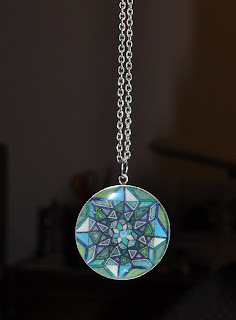 Melissa also takes custom orders and requests. If you see something you like, but it's not your size, or you'd like a different color, let us know and she'll do her best to create something just for you! Visit us on facebook, we'll have updates on new items that are available as well as items from other shops that we like and we think you'll enjoy, too! During our last trip to NYC, we made our usual trip to Kinokuniya. 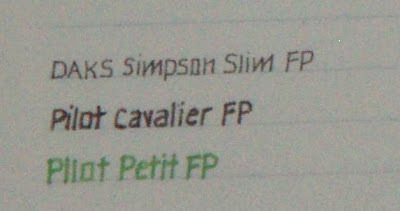 There I found the DAKS Simpson Slim blue fountain pen. 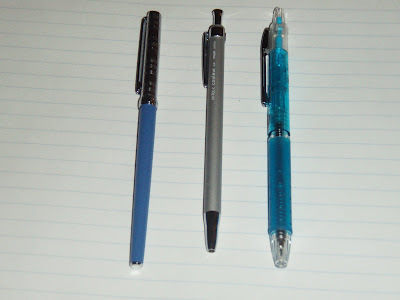 They also had a red pen and a camel-colored pen, but I picked blue since it is one of my favorite colors. 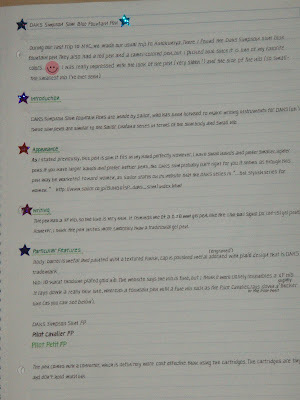 :) I was really impressed with the look of the pen (very sleek!) and the size of the nib (so small - the smallest nib I've ever seen). DAKS Simpson Slim Fountain Pens are made by Sailor, who has been licensed to make writing instruments for DAKS (UK). These slim pens are similar to the Sailor Chalana series in terms of the slim body and small nib. The pen has a XF nib, so the line is very thin. It reminds me of a 0.38 mm gel pen, like the Uni-ball Signo DX UM-151 gel pens. However, I think the pen writes more smoothly than a traditional gel pen. Body: barrel is metal and painted with a textured finish, cap is polished metal adorned (engraved) with plaid design that is DAKS trademark. Nib: 18-karat rhodium-plated gold nib. The website the nib is fine, but I think it more closely resembles a XF nib. It lays down a really thin line, whereas a fountain pen with a fine nib, such as the Pilot Cavalier or Pilot Petit, lays down a slightly thicker line (as you can see below). The pen comes with a converter, which is definitely more cost effective than using the cartridges. The cartridges are tiny and don't hold much ink. I paid $120 for my DAKS Slim Pen, which isn't cheap but well worth the money. This pen is definitely higher quality than most of my other fountain pens, and it is sleek and unique. It costs less than the Sailor Chalana, which typically costs $160+, unless you're lucky enough to find a good deal on ebay. I've only seen this pen at Kinokuniya. I guess you can probably purchase this pen in Japan as well if you ever happen to take a trip there. If you like small, sleek, unique-looking fountain pens that write smoothly and lay down a fine line, then this pen is for you. It is an awesome pen! Custom-made, Totally Unique T-Shirt Designs! (PICS! for a sample), so what we wanted to do was to find a way to get one of her designs onto a t-shirt. The drawing we wanted to use. What proved to be the tricky part was the actual ironing-on of the print-out to the t-shirt. For the first attempt, we placed the print-out face down on the t-shirt and ironed for about 2 minutes directly on the back-side of the paper. This might have resulted in too much heat being applied because the shirt started to brown. We placed a pillowcase over the paper and ironed for the recommended 90 seconds. However, when we attempted to pull back the paper from the shirt, the design itself wasn't completely affixed to the shirt so part of the design started to peel off as well. Finally, we tried ironing over the pillowcase but for about 3 minutes making sure the transfer was fully applied. This proved to be the best case as it came out beautifully. We'd like to eventually do a more professionally looking application. We just wanted to try this out. and see how it would work. One of the winners never responded to claim their prize =( so we decided to pick another winner for prize pack #3. The winning comment for prize pack #3 is... (drum roll, please)... MzMonster! Email us as soon as you can so we can ship out your winnings! If we don't hear from you by Sunday, September 13th at 7 pm Eastern time we will have to pick another winner. Congratulations to BoutiqueStitches and Passion, we'll send out your prize packs tomorrow! Thanks again to everyone for participating! 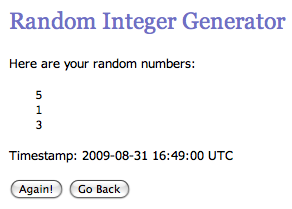 The official drawing for the Back to School Giveaway was ran with the Random Integer Generator at Random.org. So congratulations to #5 Simon, #1 BoutiqueStitches, and #3 Passion! You each have until 7pm (Eastern Time) on Sunday, September 6th to write with your shipment info. Simon, since you're post number came up first, you'll get first pick out of the 3 prize packs. Once I've heard from Simon, then I'll let BoutiqueStitches know which two are left. Then we'll send the remaining prize pack to Passion. We'll ship the prizes as soon as possible. Thank you all again for reading! Congrats to the winners and to those that didn't win, we'll certainly have more giveaways in the future so check back soon! How do you get in on all this goodness? Just drop us a comment on this post sometime before 7:00 PM (Eastern Time) on Sunday, August 30th. One entry per person, please! We'll use that gnarly Random Integer Generator at random.org (if only that would help us pick better Powerball numbers!) to pick 3 winners. The order the winning comments are generated by the "RIG" will determine the order that you get to pick which prize pack you'd like to win. For instance, if the generator comes up with your comment number first, you'll get to pick one prize pack from all three. If your comment number comes up second, you'll get your pick of the remaining two. And if your number comes up last on the generator, you'll get the remaining prize pack. Don't worry, though, there's good stuff in each one! We'll post the winners at some point on Monday, August 31st, so be sure you check back to see if you're among the lucky and if you are, then you have until 7:00 PM (Eastern Time) Sunday, September 6th to email us at the addy to the left with your info. Ever since Jetpens posted the Limited Edition Pilot M90 Stainless Steel Fountain Pens on their website, I was extremely tempted to click "buy". I'm a sucker for ultra-sleek, elegant pens; among my favorites are the Ohto Fine Ceramic Rollerball and Pilot Duo Color Cavalier, to give you an idea. But the hefty $180 price tag was enough to make me shy away. I know I can have pretty expensive taste, but I wasn't sure if I should take the plunge with the M90. However, my girlfriend knew how much I was into that pen (probably because every time she saw me on the Jetpens website, it was open to the M90) and, before I could do anything about it, she went and bought me the M90 with a medium point nib. It arrived promptly (Jetpens is always fast and reliable!) and in a large box instead of the usual Jetpens package. Inside was a sleek black box that contained the pen. However, upon opening the box, the cutout of foam where the pen was supposed to be was empty! Minor panic attack! No wait, it seems the pen had slightly shifted during transit and was just nestled under the foam. Phew - crisis averted! In hand, the pen surely is stunning. The design is ultra sleek. The no-frills approach is enhanced by the tiny "M90" inscribed on the top of the cap. The entire pen is brushed stainless steel. The coolest feature, I think, is the way the body flows seamlessly into the nib; a design so unique, I’ve never seen anything quite like it. Adorned atop the cap is a blue gem that accents the pen and it gives the pen the perfect amount of flare. 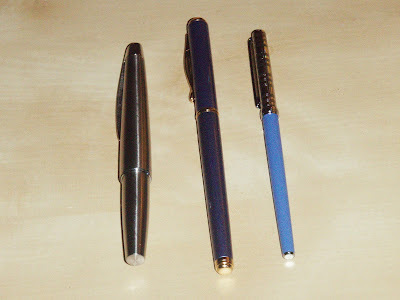 Of course, I have yet to touch on perhaps the most important aspect of a fountain pen. How does it write? Albeit with my limited experience, I can say it is the smoothest fountain pen I’ve used. (The Libelle Seabreeze a close second, followed by the Lamy Al-star/Vista) The nib literally glides across my Clairefontaine notepad as if on a cushion of clouds. I should say that, like any fountain pen, I think the ink really can make a difference in your writing experience. Initially, I used the stock black ink cartridge that came with the M90, but I think the pen’s true potential was realized when I swapped it for the J. Herbin Eclat de Saphir. 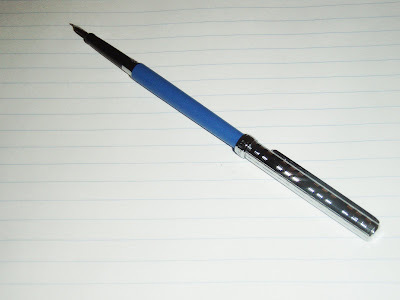 The consistency of the line makes the M90 a great notetaking/writing fountain pen. As a lefty, fountain pens (such as the Ohto Tasche) can give me trouble as often times I’m “pushing” the nib rather than “pulling”. The M90 hasn’t given this lefty any problems. Smearing or bleed-through on Clairefontaine and Rhodia notebooks aren't issues at all, although this probably has a lot to do with the ink as well. I prefer a slightly broader nib and the medium point the pen produces is the perfect size for me. It’s a nice and thick wet line. As such, I’m not sure if the medium point would be ideal for users requiring finer detail. If you can get past the premium price-tag, the M90 is certainly worth the money. It has sharp looks and it's certainly a great writer. We're two chemistry grad students sharing our thoughts and experiences about anything to do with pens. Grad school eats up a lot of our time, but we'll share with you what we can! Enjoy! What's your favorite writing pen?